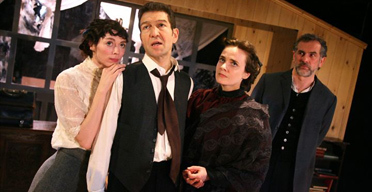 Plot: The Lady From The Sea is one of Ibsen’s most lyrical, hopeful and rarely performed plays. Married to the respectable Dr Wangel (Jonathan Hackett), Ellida (Lia Williams) has a secure, comfortable but land-locked life. She is constantly drawn towards the sea. As memories of a past love threaten to overwhelm her will she suffocate on dry land, or find freedom across the ocean? It’s my second time around at the Arcola celebrating their Ibsen season. I saw the excellent An Enemy of the People last month and had high hopes that this production will be just as satisfying. I find that after watching an Ibsen, I come out always entertained and although emotionally tortured at times, I seem to have gotten used to this unsettling feeling. What I like about the Arcola is it’s creative flexibility with the way they use their limited space to complement the production. In Enemy, there was this makeshift bath that run through just below stage level that made us feel as if we were transported to some coastal town in Southern Norway. This time around the main stage was right in the middle and structured in a way so that the actors can come out from 4 different angles, and still make us believe that it was in some small town by a fjord in Northern Norway. Now onto the beef of the play. Ellida is a study of a woman on the verge of madness- emotionally disturbed but passionately portrayed here by Lia Williams. This is when it hit me that Ibsen has an abundant resource of men and women characters, and the more I watch them come alive on stage, the more I appreciate his analysis of these exciting characters, Ellida being one of them. In this Frank McGuiness version, the transformation didn’t come from Ellida, but from her husband Dr. Wangel portrayed with sincere accuracy here by Jonathan Hackett. The supporting cast of Sean Campion, Chris Moran, Jim Bywater, Alison McKenna and Fiona O’Shaughnessy whom I saw previously in the Enemy made for another strong performance of this beautiful, lyrical Ibsen classic.